Four powerful engines, a performance-minded transmission, advanced technology, and superior engineering make the 2018 Dodge Charger performance unlike anything else on you’ll find on the streets of Jacksonville. The base engine is a 292-hp V6 that delivers up to 264 lb-ft of torque and 30 mpg/highway fuel efficiency. Drivers can upgrade to a 370-hp HEMI V8 engine that generates up to 395 lb-ft of torque and 25 mpg/highway fuel economy. The 392 HEMI V8 engine delivers 485 hp and 475 lb-ft of torque and can accelerate from 0-to-60 mph in less than 4 seconds. The supercharged 6.2L HEMI SRT Hellcat V8 engine delivers a heart-stopping 707 hp and a mind-blowing 650 lb-ft of torque. Electronic Shifter: The performance-inspired electronic shifting system requires low shift effort for a smooth transition between gears. 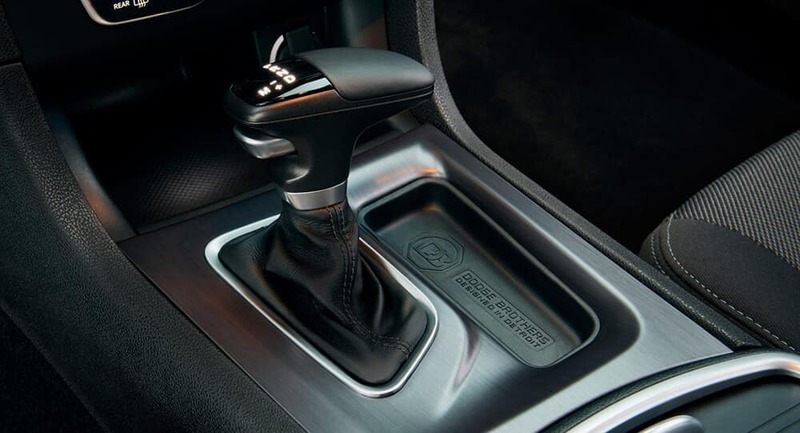 Available Paddle Shifters: For drivers who want a more interactive driving experience, Dodge offers available steering wheel-mounted paddle shifters on selected trims. Advanced All-Wheel-Drive: The Dodge Charger is one of the few performance vehicles to offer the option of all-wheel drive for superior grip in all driving conditions. Launch Control: The advanced system provides additional holding power for superior launch via the customizable in-dash controls. Dodge Performance Pages: This convenient application allows drivers to familiarize themselves with their vehicle’s performance, enabling them to improve handling by customizing the way the vehicle responds. Performance Braking: Antilock Braking, Advanced Brake Assist, Rain Brake Support, And Full Speed Forward Collision Warning with Active Braking provide exceptional control no matter what the situation. Adaptive Suspensions: Depending on trim and engine chosen, the Charger can be built with a Touring, Sport, Performance, or Adaptive Damping suspension for just the right amount of ride control. Make your Taylorville commute something to look forward to again as you experience the impressive performance features of the Dodge Charger for yourself. First, start by comparing the Dodge Charger vs. Chevy Camaro or Dodge Charger vs. Dodge Challenger in performance and interior highlights. Contact Green Dodge today or visit our showroom in Springfield to learn about our competitive purchase and lease offers.